After many years of being hassled and questioned about “when, when, when…” it is with great pleasure that I announce: Kim and I are having a baby!! Thank you, thank you, we appreciate all your well wishes. We are very excited. 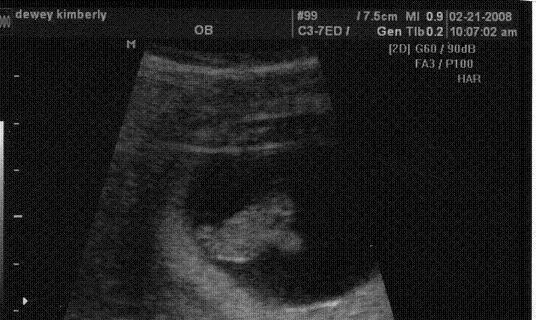 Here is the first picture of our little “bean.” It was taken Feb. 21 at 8 weeks 6 days. The baby is due in late September and Kim has informed me that it will be a girl. If you are wondering how we could know at this early stage, Kim consulted the highly scientific “Chinese Lunar Calendar Gender Prediction” chart. She has it on good authority that this method is always correct (I have my secret doubts about that, but play along just for fun). Well, let me tell you about this interesting little city in North Texas called Mineral Wells. Kim and I first went to Mineral Wells last year on a camping trip. We had planned on staying at Lake Mineral Wells State Park, which is just outside the city. When we got there, we didn’t have a reservation and the campground was full, so we decided to head to a different state park a little farther west. 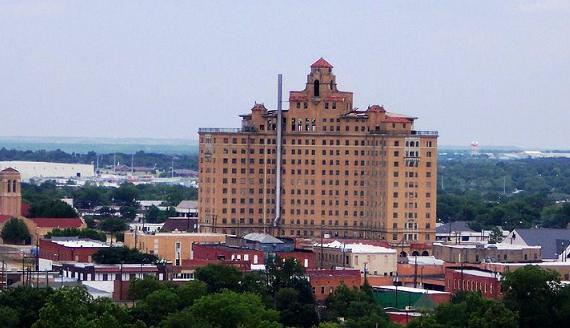 On our way we had to pass through the city of Mineral Wells. At first it seemed like any other relatively small city you might find out in the country, but as we got farther into town we saw what looked like a skyscraper dominating the city.